A new visualization provides viewers with an immersive, 360-degree, ultra-high-definition view of the center of our Galaxy. This movie is a "sequel" to a visualization of the Galactic Center released in January 2018. This new version provides more details of what Chandra sees in X-rays in the region around the Galaxy's supermassive black hole. Viewers can see the effects of winds blowing off dozens of massive giant stars in this crowded galactic environment. Credit NASA/CXC/Pontifical Catholic Univ. of Chile /C.Russell et al. 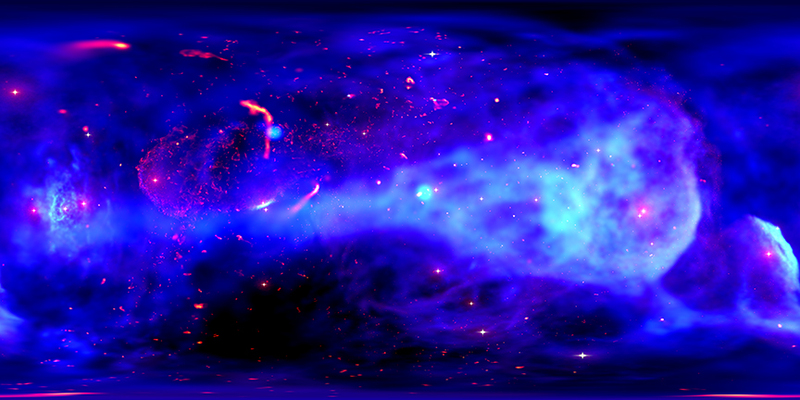 A visualization of the center of our galaxy. About 26,000 light years away from Earth. With data from Chandra X-ray Observatory and other telescopes. Stars orbiting within a few light years of the center of our Galaxy. In the center of our Milky Way galaxy.